A good friend of mine just found out that she is allergic to cow’s milk and I wanted to provide an easy and favorite recipe. This allergy is different than lactose intolerance, the inability to fully digest lactose (milk sugar) in dairy products, which is caused by a deficiency in lactase. Milk allergies are more serious and can be caused by an allergy to casein (the protein in cow’s milk) or whey. I am using feta, which is made with sheep’s milk and a little bit of goat’s milk, (read the ingredients carefully, today it is common to find feta made commercially with pasteurized cow’s milk). You should be able to find authentic feta made with sheep’s and goat’s milk at the grocery store or a specialty food store. Most people find that they can tolerate goat’s or sheep’s milk products much better than cow’s milk. You can always substitute goat cheese in this recipe, but it won’t have the same briny tang and will be a sweeter dish. Place pine nuts in a dry skillet over medium-low heat. Shake the skillet frequently to ensure even browning—the pine nuts are small and full of rich oils and can burn quickly. When the nuts are fragrant and golden, take the pan off the heat. Transfer the pine nuts to a plate to cool. 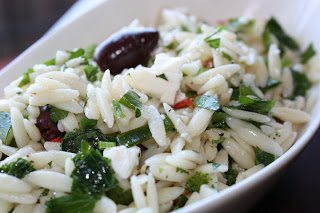 In large bowl combine pasta, tomato, cucumber, onion, feta, olives, pine nuts, parsley, lemon juice, olive oil, oregano, salt and pepper. Toss and chill for 1 hour in refrigerator. You have a lucky friend, you came up with such a yummy solution for her!! 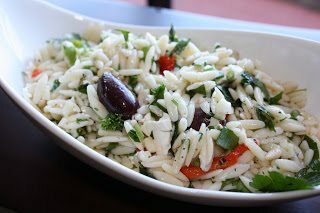 A terrific orzo salad, I love the Greek flavors! Never had orzo pasta before, this one looks good! I love evrything about this (except kalamata but I could also replace them). It looks lovely….and my daughter's recently fallen in love with Orzo in soup! I got many informations and recipes from you blog.I love evrything about this.All these recipes looks delecious.If you want to get more relevant and updated informations about Nutrition plz.visit us.